The finest filter coffee machines in the world. Filter coffee is a gentle brewing method - it brings out the true character and clarity of coffee. The result is smooth and full flavoured. Filter brewing is a great way to appreciate all the great quality coffees now readily available from Monks Coffee Roasters. Moccamaster coffee machines are handmade by Technivorm in Amerongen in the heart of The Netherlands. 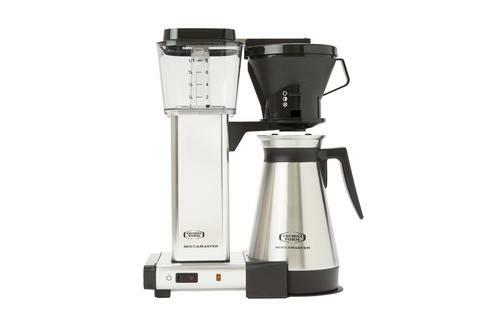 Technivorm has been producing filter coffee machines since 1964.These classic and stylish machines are made using only the best quality components and materials and are iconic in coffee circles in many parts of the world. Each coffee machine is checked and individually tested before it leaves the factory in Holland. A powerful copper heating element is the key to reaching the correct temperature quickly and efficiently and to keeping it consistent throughout the brewing cycle. The coffee brew time must also be correct to get the right contact time between the water and the coffee grounds and the Moccamaster meets this criteria. 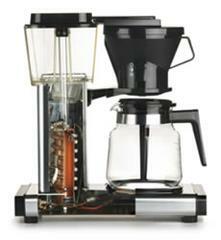 The 6 minute brew time perfectly extracts all the flavours and delicate nuances from the coffee grounds. "We manufacture products which the consumer has 100% confidence at all times. We work for a better environment through energy efficient products with an extra long life. We use recyclable and degradable products, and we guarantee our products for 5 years."